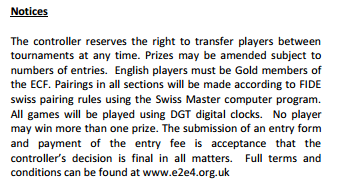 Leading on from yesterday's posting, in which we explored the absence from the English Chess Federation minutes of any apparent reference to the decision to create an online forum that nobody wants. While I was hunting about in the minutes from last spring and summer I also found myself - God, I know how to live - trying to find any reference to the English Seniors Championship which, as per our post from two weeks ago, went disastrously wrong. Were tenders invited for the award for the event? Yes, from approximately the full month of November 2013. OK.I'm not sure what "approximately the full month" means, but that's not of any importance - let's take it as November 2013 and let's bear in mind approximately. Where can we find any reference to the award of the event in the Board minutes? Just to continue, for a moment, with the palaver about the "official" English Chess federation online forum which few people use and even fewer people like. Who actually decided to set it up anyway? Well yes, the Board of the ECF, or somebody on that Board, that much is obvious. But when did they decide, on their members' behalf, to set it up? and I can find at least one thread dating back to 23 June (started by the mysterious Sue Dunham, who I will assume in the absence of any contradictory information to have been an ECF official). I found this week’s position, just like BORP? 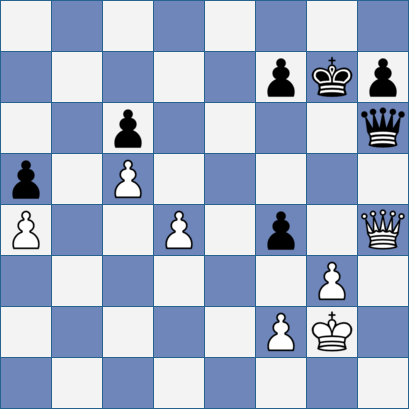 XXXII's, in Grandmaster versus Amateur (Quality Chess, 2011). A book that doesn’t seem to have made much of an impression on public chess consciousness, but one that I really liked all the same. Did Shaw in his notes indicate why he rejected it? "It" being the red pill option of trading to a won pawn ending. Answer: yes he did. I could argue I was following John Nunn’s DAUT dictum (Don’t Analyse Unnecessary Tactics) and the rook ending in the game is a simple win. 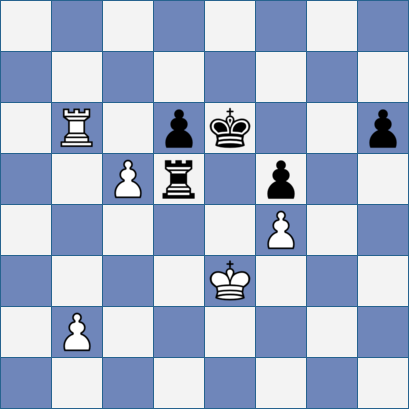 The truth is I was falling into the habit of avoiding all tactics and I never spotted that 41 Rd6+ was a legal move. Anyhoo, back to Aagaard against Tocco which is mentioned in the first chapter of this rather lovely collection of essays. It was educational to read and hear the various neurological experts on whom the media called for their expertise and opinions following Nigel Short's "hardwiring" and parking comments. The Guardian had Dr Dean Burnett. ...had none other than Tony Buzan. This series (starting here) has been mining the archive of the Surrey County Association Match Books which go back to the first of Surrey's county matches in 1884. They record, from then on, in more or less detail, the personnel of both sides in the County's matches up to 1967. There has to be a limit to the interest that this material can sustain, and I suspect that we are getting close to it. But before we throw in the towel we may be able to wring one or two more blogs from the Books. And here is one of them. We noted in the last two episodes (here, and here), when we were investigating the matches against "Croydon", that not all the matches recorded were against county opposition - and you could go further and say that neither were all the matches played even by a full Surrey County team. This episode will continue that theme. Just a footnote to the banning of Carl Hibbard from the English Chess Federation's online forum, as per yesterday's post. This touched on the fact that Carl was accused, by the ECF's Commercial Director, Bob Kane, of being "registered from day one in one name or another"
which is to say, of having registered in a names or names other than his own. but at the time of writing had not been forthcoming. Now there's a trivial but interesting point relating to this, which is that in that forum's early days, it possessed a poster called "Sue Dunham" which, as even the doziest of us eventually realised, was not a real name but...yes indeed, a pseudonym. Ho ho. This particular sock-puppet lasted several weeks until disappearing, or rather being asked to disappear. Today's post is about how Bob, Chris and Phil don't like Carl. Carl, for his part, doesn't like Bob, Chris and Phil. David and Mike don't like Bob, Chris and Phil any more because Bob, Chris and Phil don't like Carl. But Bob, Chris and Phil say Carl is somebody else as well as Carl. Carl says he isn't and Alex wants to know what Bob, Chris and Phil are on about. What am I on about? 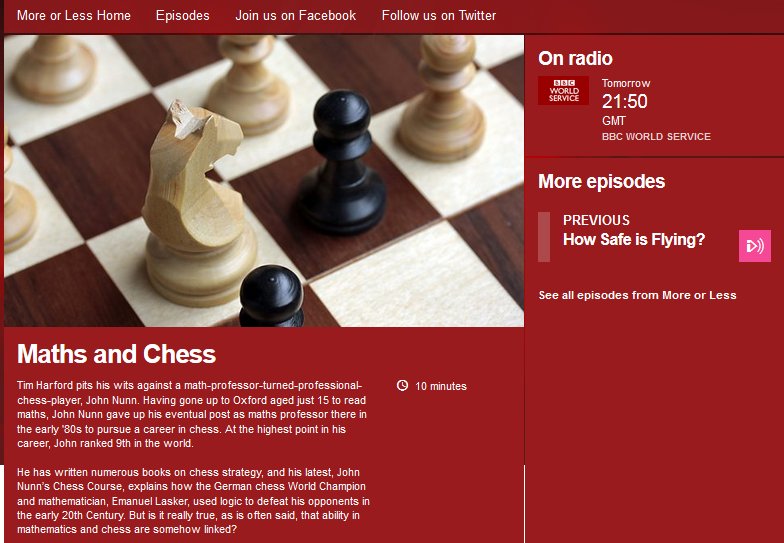 Last week Carl Hibbard was barred from the English Chess Federation's forum. Who is Carl Hibbard? 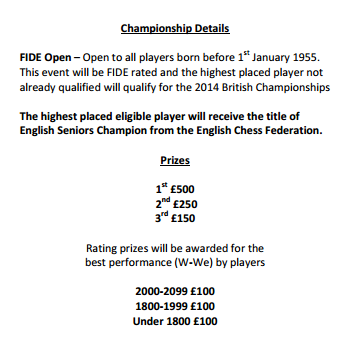 Carl Hibbard runs the English Chess Forum, which is not the same as the English Chess Federation's forum. Good Lord, Nigel's on the telly. Nigel does not think this is wholly fair. To some extent he's right - it's not hard to pick very large holes in any of these articles - though at the same time I'm not entirely sympathetic. After last week’s detour to St Louis (We Need to Talk About Wesley) I’m still not quite ready to go back to reviewing Benjamin’s Liquidation on the Chessboard. A review which has morphed into a rambling dissertation on all chess books (most recently: On Lessons and Chapters), if I’m honest. 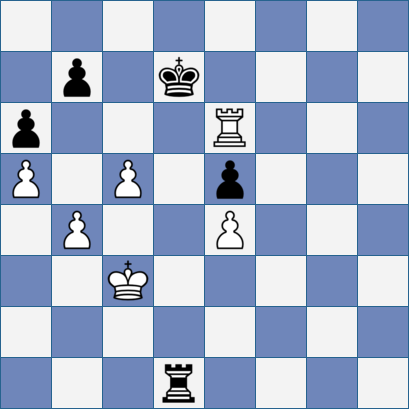 I feel the need to report that I have played my first king and pawn endgame of the year. 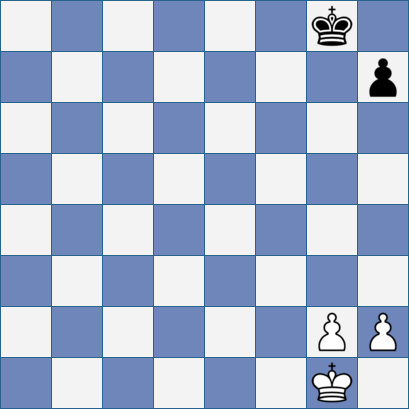 It was not a lengthy affair - it lasted precisely half a move - but it was a pawn ending nonetheless. I am not an expert driver. There's all sorts of reasons why this might be so, but perhaps the best is that I scarcely drove at all in the twenty years after passing my test just out of my teens. A few weeks driving between Oxford and Didcot to a mercifully short-lived employment in 1995 and that's pretty much it. These days I drive round Spain to pursue my living and I'm perfectly safe on the roads, but those twenty-odd years have had their effect. I don't like city driving (all right,nobody does) and I can't park a car to save my life. So when we need to reverse the car into our lock-up, my wife, a proper driver, does it. So as I don't crash it or anything. Like I say, there's all sorts of reasons why this might be so, but nobody's ever suggested that it might simply be because of my gender. 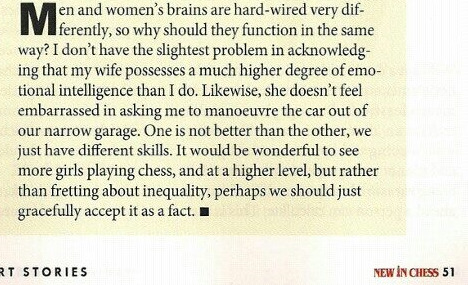 Here's Nigel Short in New In Chess last month. There's a few things about the piece that might be worth coming back to, but the ending is perhaps the best bit. My thanks to Jon Manley for reminding me of the following, which makes the point unsubtly, and yet probably more subtly than I would have. I'd have settled on something like this. About exactly a year ago the 2014 English Seniors Championship took place in Sunningdale Park, in Berkshire. It didn't go well. was, when the time came to pay the prizes, considerably reduced. specifically allowed for the amendment of prizes. The Federation's CEO, Phil Ehr, dismissed the complaints. I don't myself propose to adjudicate on the dispute, here or anywhere else: what interests me here is not the disagreement between the players and the organisers, but the role played by the ECF in what, outsourced or not, was their competition - and regarding which there was evidently some disagreement within the ECF Board itself. Why do I say so? Because in the middle of the controversy the Commercial Director, Bob Kane, resigned. He later retracted his resignation, but nevertheless one could detect that not all had been entirely well. I couldn't find much about the matter in the ECF Board minutes so, on November 4 last year, I sent Phil Ehr, by email, a number of questions about the ill-fated tournament and the ECF's role within it. So he did, Stephen, so he did. There have always been cheats and charlatans in the game. So there have, Stephen, so there have. A few years ago I was playing this game during which my opponent started moving his pieces with one hand and pressing the clock with the other. The first time I let it go in case it was a one off. The second time I asked him not to do it again. On being challenged the guy said that he didn’t know that he wasn’t allowed to use both of his hands. Frankly, I found that rather hard to believe. Partly because I knew for a fact that he’d been playing for years, but mostly because he’d said exactly the same thing when exactly the same thing happened when we'd played before. Which brings us to Wesley So. For us lesser mortals, not destined for chess superstardom or, as in my case, anything remotely like it, chess has to take its place in among competing compulsions. Writing a novel might be one: David Hodgson, the genial secretary of neighbouring Crystal Palace CC has just self-published his first - Can I Touch Your Face? I bought a copy (details of how you can get yours at the end) and grabbed the chance to blog about our local chess-playing novelist, for which David generously spared his time to answer a few questions. Chess has a small part in his plot (it first appears on page 144), and that's where we start. I don't know if you remember this from a few weeks ago. It's an odd and intriguing claim for a variety of reasons, one of which is that the "British Olympic Chess Squad" is a non-existent entity - let's assume he means the Olympiad and that the squad he refers to is the English one - and another of which is that I haven't the faintest idea when he might have been any sort of advisor to such a squad. Buzan obviously thinks he was, though, since he keeps on making the claim: you can find it in any number of other Buzan-related sources. Here, for instance, is Buzan Asia. That one is members of the British Olympic Chess Team rather than the British Olympic Chess Squad, but let's assume that it's the same thing under a different, equally inaccurate name. What's the basis in reality of that claim? Tony Buzan is an adviser to the British Olympic Rowing Squad as well as to the members of the British Olympic Chess Team. 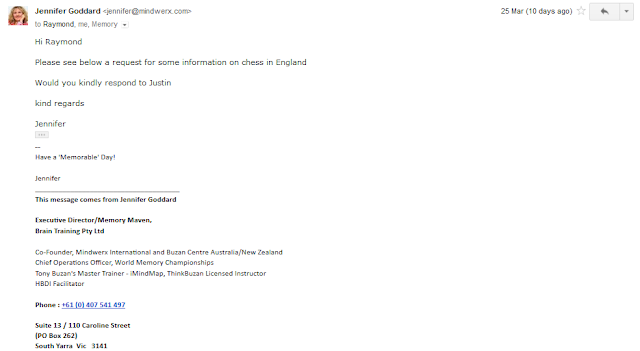 I am British, I play chess and I had never heard that Mr Buzan was an advisor to our chess team. Would it be possible to ask Mr Buzan when this was and whether it was an official post? I didn't get a reply to this email, but no matter, since one virtue of the claim appearing all over the Buzan empire is that there is always somebody else you can ask. Like Aulis Publishing for instance, whose site mentions the British Olympic Chess Team, rather than the "members" thereof. So I also wrote to them. Tony is also an advisor to international Olympic coaches and athletes and to the British Olympic Rowing Squad as well as the British Olympic Chess Team. And stone me if I didn't get a reply to this one. We will ask Tony Buzan for more information about this post. The British Olympic chess squads, this time. I amended my email accordingly. Tony is also an advisor to the international Olympic coaches and athletes and to the British Olympic Rowing squad, as well as the British Olympic chess squads. I am British, I play chess and I had never heard that Mr Buzan was an advisor to our chess squads. Would it be possible to ask Mr Buzan when this was and whether it was an official post? And again, I got a reply. It didn't refer my question to Tony Buzan this time. It referred the question to somebody else. I do hope you'll take a "quick peak" at Jennifer's chapter before moving on to the question of what happened to the email which she forwarded to the address below. The answer is, so far, nothing. Not a whisper. Not a sausage. Not a word. This is curious, since the email address belongs to Tony Buzan's biographer, who must surely know the answer if anybody does. Not that I have read the biography, though I'm given to understand it is no help in locating the answer to our question. But nevertheless its author is surely the man for the job. So come on Ray, what about it? What role did Tony Buzan have giving what advice to which members of which Olympic squad or team? Are you even sure Benjamin's book is meant as instruction? 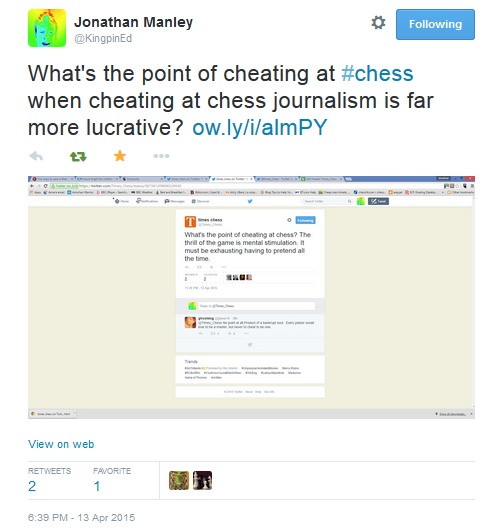 Dunno, but New in Chess (the publisher) think that it is. 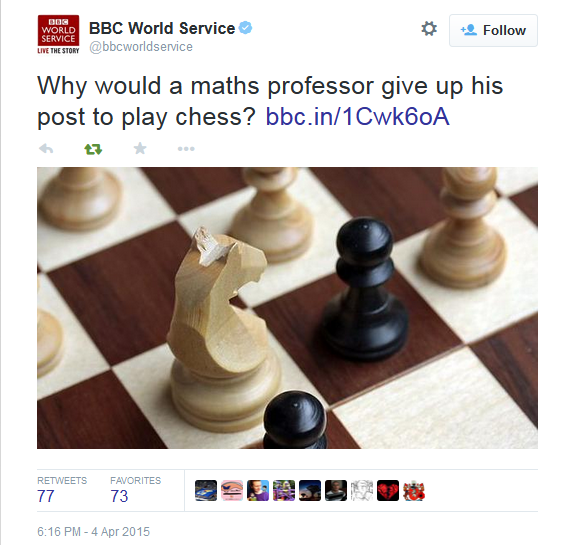 Dunno, but New in Chess think that it is and if the author feels differently then it’s his fault that nobody knows. 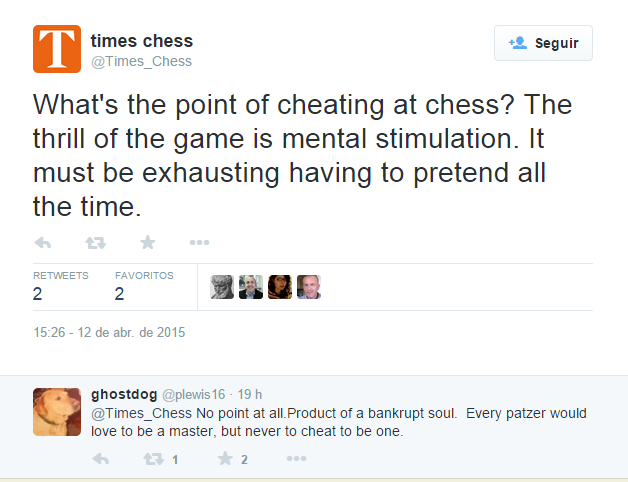 Dunno, but New in Chess think that is and if the author feels differently then it’s his fault that nobody knows. Look at Jonathan Hawkins’ From Amateur to IM if you want a model for how an author can make his intentions absolutely clear. ...but since you ask, did Dr Nunn actually ever become a professor? I wasn't under that impression. Maybe he did. Maybe they'll tell us in the show. Do listen. I’ve ... seen things you people wouldn’t believe. An uppity computer claiming mate in two when it isn’t. I watched Ginger coming over all International Arbiter in a game with Scary on a tour bus (which may or may not have been near the Tannhasuer Gate at the time). Glaring continuity errors lost in time like chess scenes edited out of a movie script. Yes, sometimes Chess goes to the Movies. If it doesn’t always travel very well, one honourable exception is Blade Runner. The director’s cut of Ridley Scott's hugely marvellous film is released in cinemas for the first time from today and your author is rather delighted to have a ticket for the first screening at the British Film Institute on the Southbank. If dystopian futures aren’t your thing but you want to go to the pictures (as we used to say when Batty and Deckard were first giving it large on rainy Los Angelesian rooftops), perhaps you’d prefer Dark Horse. 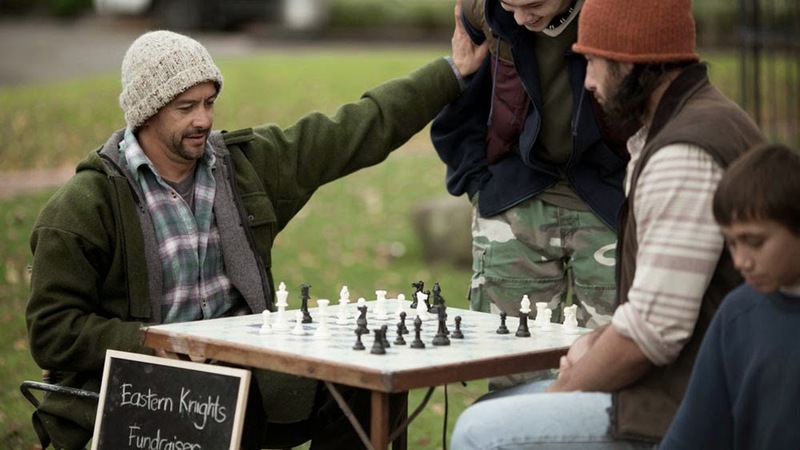 Chess but without the pollution, Voight-Kampff tests, or - presumably - murderous robots. You pays your money, you makes your choice. Dark Horse is also out today. We accept that all Mr Keene's business dealings have been entirely proper and above board, especially those relating to the Interzonal at Tunis in 1985, his contract with Mr Viktor Korchnoi in 1978, his activities relating to Brain Games, his hosting of events at the House of Lords and all such similar activities. We accept that Mr Keene is in fact a well-respected figure within the chess world and not at all the "tawdry" or "disreputable" figure that we have occasionally sought to paint him. He does not have a circle of cronies, especially not Mr CJ de Mooi or Mr Steve Giddins and nor does he misuse his chess columns to plug his friends, family and business partners. We accept that Mr Keene has at no point ever engaged in plagiarism and nor would he ever do so. Nor would he recycle old material without informing the reader. Except possibly now and then by accident. We therefore withdraw all claims and allegations that we have made against him and offer a public apology for traducing his good name. We have in addition made a substantial donation to the Brain Trust.